The Triple-A All-Star Game isn't for another two weeks, but Kevin Cron and Jabari Blash played some Home Run Derby a little early. The D-backs No. 19 prospect and the Angels outfielder both blasted off three times in Reno's 14-4 slugfest win over Salt Lake on Wednesday night at Greater Nevada Field. 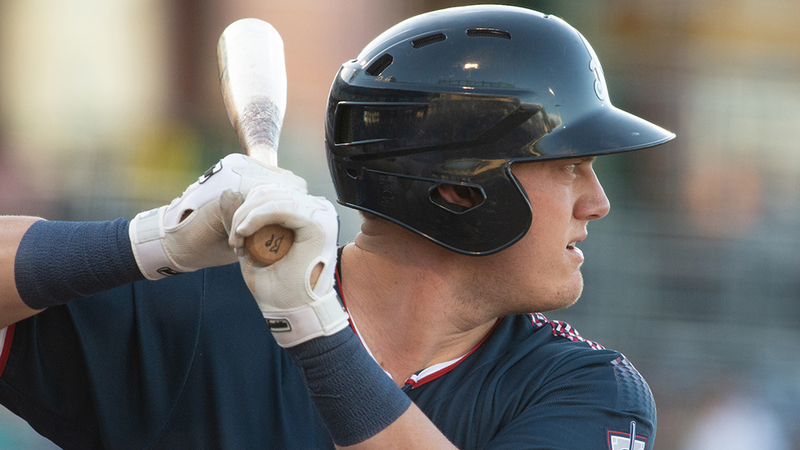 The Aces mashed a team-record six homers in the game as both squads combined for nine dingers. Being part of a night in which the teams totaled 18 runs and 22 hits was a thrilling experience for Cron, especially after coming out on the winning side. "Obviously they jumped out early with a homer of their own in the first inning," Cron said. "It was just nice to bounce back and get on the board and give our pitchers some runs to handle. After that, we kept getting into some good at-bats. I came up in some situations to get some good pitches to hit and everything kind of went from there." Blash has three multi-homer games this season and stands first in Triple-A with 22 homers, second in the Minors only to third-ranked Royals prospect Seuly Matias with 24. He was disappointed to be on the losing end of this game, but Blash said he's pleased to continue a strong year at the plate. "It was a tough game, but I was just trying to have good at-bats," Blash said. "I was just trying to keep my swing short and have a good day at the plate. But it was a tough game." Already eclipsing his 2017 mark of 20 homers, the 28-year-old has produced all season long in the Pacific Coast League, sporting a .342/.442/1.237 slash line through 53 games. Blash has remained steady within his approach, and what Cron and Reno were amassing on the other side wasn't going to affect him at the plate. "I'm just making small adjustments and not trying to do too much," Blash said. "I'm just getting my at-bats, so it's been a fun year. I'm still working, I'm growing and it's been a fun team to be with." Blash started the tally in the first inning when he slugged a 1-0 offering from Reno starter Anthony Vasquez over the center-field wall for a two-run homer. The Aces jumped on the board with three runs in the second, but got into the homer act in the third. Socrates Brito led off the frame with a homer off Luis Pena to right-center. Two pitches later, Cron slugged an 0-1 offering to center for his first home run of the evening. After a 10-pitch at-bat in the fourth, Blash connected again off Vasquez on a solo shot to left-center. In the bottom half of the frame, Brito and Cron hit consecutive homers for the second straight inning, both to right field off reliever Ryan Clark. It marked the first time in Aces' history the team had two sets of back-to-backs in the same contest. "It was cool, I'm not usually on the back end of those back-to-backs, I usually choke under that kind of pressure," Cron laughed. "So that was cool to be on the back end, not once but twice. Obviously, Brito was getting it done. He's been getting on base a lot with me hitting behind him. It was cool to see him do my thing and put me in a situation to get good pitches also." The teams traded dingers again in the eighth. Blash started it off by crushing another solo homer to center off Joey Krehbiel in the top half. "Every home run counts and it's the second time I've [hit three homers in a game]," Blash said. "But for me, I just try to put a good swing on the ball. It would have been more fun if it were a close game or we were in the ballgame. ... It's just not giving away at-bats, it's a focus thing. A lot of these at-bats are tough, they're not just going to feed me fastballs. Once my swing's short, I'm just putting the ball in play and I'm looking for hard contact. I think that's when the results come." In the bottom half, the Aces loaded the bases against catcher Francisco Arcia, who was handling mop-up duty. On a 2-1 pitch from Arcia, Cron belted a grand slam to left-center, giving him a career-best seven RBIs to cap off a night of memorable milestones. Hitting the final roundtripper against a position player didn't take away from the special moment, although Cron said it almost threw off his normal routine in the batter's box. "Honestly, any time you're facing a position player, sometimes you don't know what to think," he said. "You're just up there trying to stay within yourself because it's not necessarily the same type of competitiveness from their end, I guess. You're just really trying to barrel down on a good pitch. [Arcia] walked a couple of guys in front of me, so I was just really trying to get a good pitch. And I was obviously able to land on it and it was a really cool experience." It's the second time both have hit three home runs in one game -- Cron did last season with Double-A Jackson and Blash when he was with the Mariners in 2014. The D-backs infielder said he'll always remember those moments, though he was happier his team won the game this time. "After a night like tonight, you get a lot of confidence from that and doing what we did as a team, you get a lot of confidence from that as well," Cron said. "It's hard to forget when you have nights like that, and last year's was pretty special as well. I think the third one tied the game in the ninth, so that was pretty cool too." Cron, who missed over a month of the season on the disabled list, has six homers in June and 11 for the season. After blasting 51 homers in the Southern League the previous two years, his power has played well on the new circuit. "It's just a product of the situations you've been putting yourself into in the previous at-bats," Cron said. "Sometimes you just run into a night where everything comes together and all the at-bats you put in in the days leading up to it -- weeks, months, whatever it is leading up to it. Just continually barreling down on the same approach. "Every now and then you're going to run into a day where it all comes together and tonight was one of those nights."